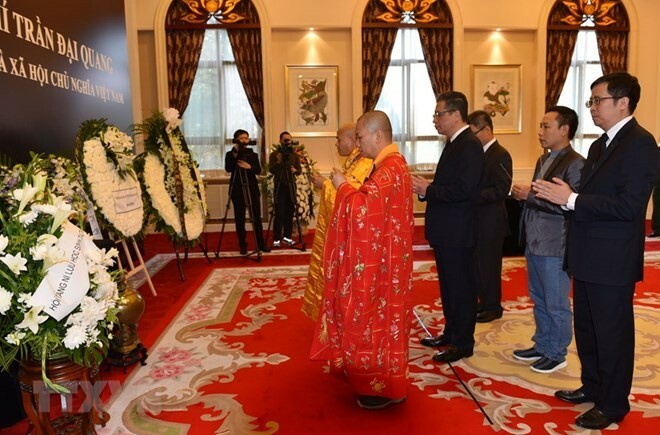 (VOVWORLD) - The Vietnamese Embassy in China on Wednesday held a respect-paying ceremony and opened the funeral book for President Tran Dai Quang who passed away on September 21. Speaking at the event, Vietnamese Ambassador Dang Minh Khoi highlighted President Quang’s contribution to bilateral ties between Vietnam and China. The same day, representatives of foreign missions in China paid tribute to President Tran Dai Quang. The Vietnamese Embassy in the US held a similar event on Wednesday. Crowds of representatives from the US administration, organisations and diplomatic offices of many countries in Washington DC came to pay tribute to the Vietnamese President. Patricia Mahoney, Acting Deputy Assistant Secretary of the State stressed that President Quang was a devoted and dedicated leader, a great friend of the US, who always supports the expansion of the Vietnam-US comprehensive partnership. The same day, many agencies of Canada, diplomatic delegations, friendship organizations and Vietnamese expats living in the country came to pay tribute to President Quang at the Vietnamese Embassy. 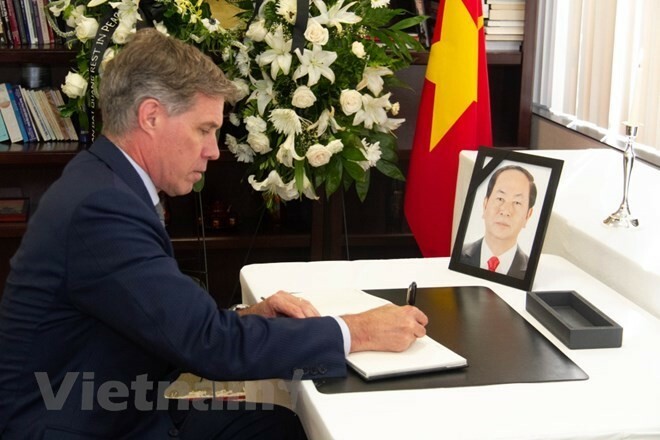 In Switzerland, the Vietnamese Permanent Delegation by the UN, WTO and other international organizations held a respect-paying ceremony and opened the funeral book for President Tran Dai Quang. Ambassadors and representatives of foreign missions in Geneva including the Director General of UN Office in Geneva Michael Moller came to pay tribute to the Vietnamese President. 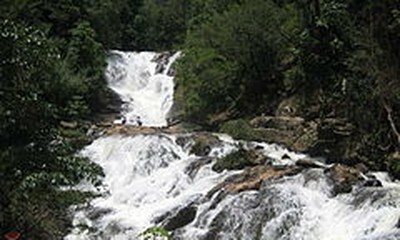 On Wednesday and Thursday, the respect-paying ceremony for President Tran Dai Quang was held in the UK, Germany, Argentina, the Czech Republic, Ukraine, Malaysia, Turkey, India, Israel and New Zealand, Belgium, Mexico, Mozambique, the Republic of Korea, Hongkong(China), Sri Lanka, and Maldives.